Biscuithead and the Biscuit Badgers' biscuity CDs page! Dinosaurs Ate My Caravan is our newest. "My favourite album of the year...every track on it is a gem. The lyrics are a thing of beauty"
Each costs £5 so please feel free to buy several. We've cleverly spread our best songs across all of them: £15 for all three. You get all the advantages of full-colour professional CD print, a lovely booklet with the lyrics and lots of Dean's lovely pictures, but if that all seems like far to much hassle, use the audio downloads badger below buy the audio files. You can also buy the audio from CDBaby, Itunes and the like. and if you're the sort who likes to sing along, click the badgers below to download the lyrics. 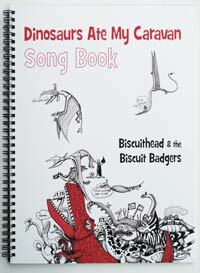 You also might want to consider our song book below. 50 pages long with all the songs from the album, the chords and ukulele tab.